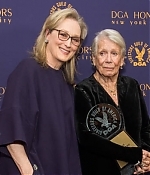 Actress Meryl Streep attended at Bloomingdale’s presenting Katie Couric with the first Caring Star Award for her work as co-founder of the NCCRA. The website americanforests.org reported that Meryl Streep can now be heard narrating public service announcements for AMERICAN FORESTS, the nation’s oldest nonprofit conservation organization and a world leader in planting trees for environmental restoration. The new PSAs are currently airing on ABC, CBS, HGTV, Animal Planet, and dozens of local network television affiliates and cable companies across the United States. Streep recently recorded the PSAs while she was in New York City, appearing in a theater production in Central Park. Christopher Reeve joined some 1,000 friends and donors at the Waldorf Astoria in New York City Tuesday for “A Magical Evening: Discover the Magic,” a black-tie fundraiser for the Christopher Reeve Paralysis Foundation. Helen Hunt hosted the event, which was attended by couples Kevin Bacon and Kyra Sedgwick and Susan Sarandon and Tim Robbins, as well as Billy Baldwin, Denise Rich, Meryl Streep, Glenn Close and Joe Pantoliano. Hollywood.com reported that ten years after it became a sensation on Broadway, Tony Kushner’s Pulitzer Prize-winning gay-themed play Angels in America, May be coming to television as an HBO miniseries starring Al Pacino and Meryl Streep and directed by Mike Nichols, the New York Post reported Friday, citing a person close to the project. The project will be a joint production between HBO and A venue Pictures and would be aired as six one-hour episodes, the newspaper said.